Frame finish: chrome, nickel and brass plated steel, lacquered tubular steel in various colors. Upholstery available in different fabric and leather covers. Modernist upholstered tubular steel stool, Germany, 2015. 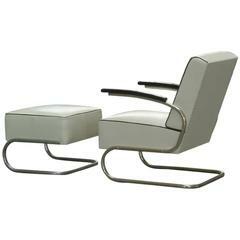 Armchair / cantilever tubular steel brown leather from Mücke Melder, 1930s. New leather upholstery. Czechoslovakian tubular chrome armchairs, 1930s. The upholstery was probably replaced in the past. Chrome is in good condition. 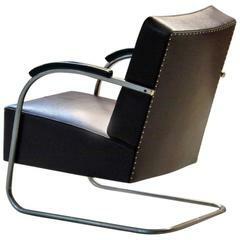 Armchair or cantilever tubular steel brown leather from Mücke Melder, 1930s. New leather upholstery.